Since, prevention is better than cure it is always preferable to prevent cracking to a certain or a possible extent than to think of repairs in the future due to various reasons. One of the frequent occurrences of cracking of concrete is due to plastic shrinkage of plastic settlement. This paper deals with various aspect of these types of cracking. Both plastic shrinkage and plastic settlement cracks occur within a few minutes or hours of concrete placing and finishing. They occur when concrete is still in plastic state and has not fully hardened. They can be seen as early as 10 minutes from the time of placing and finishing to as late as 3 hours after placing. Fresh concrete when placed in deep formwork such as that of column or wall has a tendency to settle or subside. If this settlement is restrained due to obstructions like steel bars or large aggregates it causes short horizontal cracks and the subsidence due to reduction in volume is termed as plastic settlement cracks. 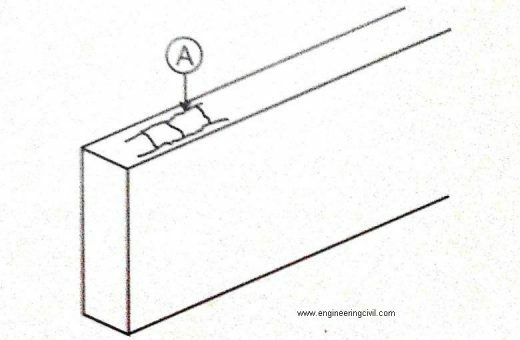 If the settlement of the solids in concrete can occur freely and without restraint, there will be a reduction in the volume or depth of the actual concrete cast, but no settlement cracking will occur. Some typical plastic settlement cracks are illustrated in the figures given below. 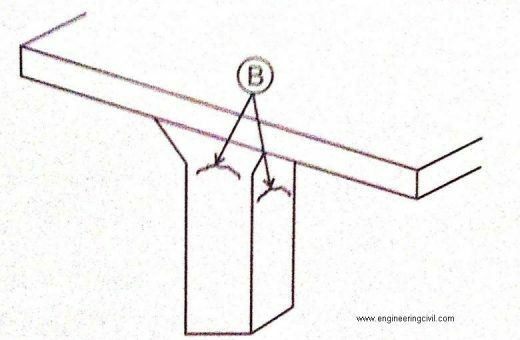 Figure 2: Plastic settlement cracking are those caused by pronounced changes of section such as the cracking below flared column heads (See B). 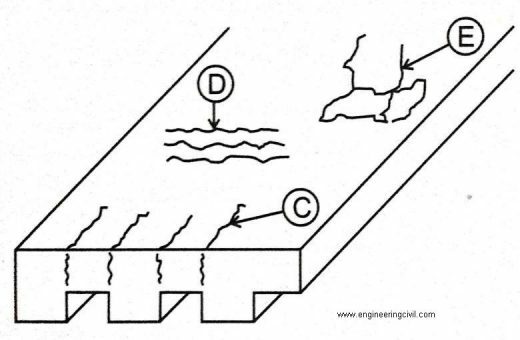 Figure 3: The changes in section of trough and waffle floor slabs, causes more settlement in the webs than in the comparatively thin flanges and results in cracking (See C). 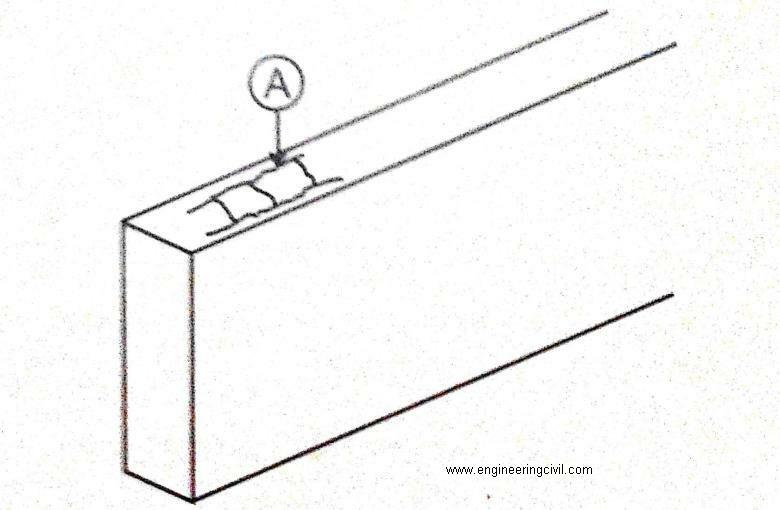 Dry soil or absorbent formwork, an exaggerated type of plastic settlement cracking is likely to occur. In such cases the cracks will usually follow the reinforcement pattern and run parallel to each other (See D in Fig.3). In slabs rapid drying of fresh concrete at the exposed surface causes plastic shrinkage when the rate of loss of water from the surface is more than the rate at which the bleed water is available. Due to this rapid drying, the surface concrete becomes too stiff to flow but is not having the strength to withstand the tensile stresses caused by restrained shrinkage. This causes concrete to develop cracks on surfaces. These are generally parallel to each other. Spacing must be assumed between 0.3m to 2m apart, upto 25 to 50mm in depth or even pass through the entire depth of the slab with thickness varying between 1 mm to 2 mm. The cracks also form a random pattern or a map pattern (See E in figure 3). However, the most features of plastic shrinkage cracks are that they do not normally extend to the edge of the slab because this is free to shrink without restraint. Plastic shrinkage cracking should not be confused with ordinary drying shrinkage cracks, which occur only after a considerable time. Plastic shrinkage cracks form within the first 3 hours of casting although they are often not noticed until the following day. They are not directly affected by the reinforcement in the concrete. Plastic shrinkage cracking is essentially a physical action, similar to the shrinkage of clayey soils under drying conditions. Surface tension forces or the effects of flocculation of the ultra fine solid particles in the mix probably cause it. The most common pattern of plastic shrinkage cracking is also diagonal to the edges on the roads and slabs, which are generally unreinforced. Before examining the causes of plastic shrinkage and settlement cracking a clear understanding of segregation and bleeding of concrete is necessary. Segregation is separation of the various ingredients of fresh concrete, so that they are no longer uniformly distributed. Segregation can take place if the proportions of fine aggregates and cement are inadequate to give concrete good cohesiveness or if the concrete is carelessly transported, placed and compacted. Generally, fine materials separate out from the coarser materials or vice versa causing non-uniformityin the fresh concrete. There are two kinds of segregation. The first is the one described above occurring in mainly dry non-sticky concrete mixes and the second is bleeding which occurs in wet concrete mixes. Bleeding is said to occur when water (considered to be blood in concrete) frpm the freshly placed and compacted concrete appears on the surface before it has set. After the concrete sets bleeding stops and can no longer take place. Water being the lightest ingredient in fresh concrete rises to the surface and the heavier ingredients like aggregates tend to settle under the force of gravity. However, well concrete may have been compacted, the force of gravity tends to pull the heavy solid particles downward, the lighter water being displaced upward. This upward migration of water is known as bleeding. Bleeding ceases either when the solid particles touch each other and cannot settle any more, or when the concrete stiffens due to cement hydration and prevents further movement. Bleeding is affected by many factors, but the most important in practice are the grading of all ingredients and the consistency of the mix. Mixes, which bleed excessively are those, which are harsh and not sufficiently cohesive. Basically this is caused by the lack of very fine materials in the mix. Obviously it is generally due to the use of coarse sands or when the sand content has been kept low. However, even while using fine sand adequate precautions are necessary to prevent segregation, usually when the fine aggregate content is less than 30% of the total aggregate content. If mixes exhibit any serious bleeding, the sand content should be increased to a value closer to the optimum voids content of the coarse aggregate, typically about 35% for crushed rock aggregate. Bleeding will then be significantly reduced. Reduction in the volume of the cement-water system due to bleeding and segregation. Internal restrainment due to reinforcement steel or large size aggregates. External restrainment due to relatively narrow formwork. Pronounced change of concrete cross section. Absorbent sub base or formwork surface. Flared column heads, troughs and waffles in floor slabs. 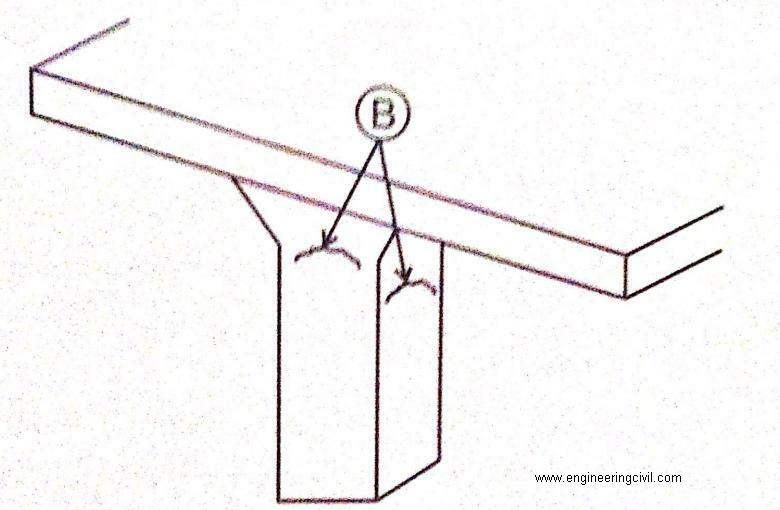 Bulging or settlement of formwork and supporting system. Rapid water loss due to high ambient temperature, wind and low humidity. Water loss due to absorption by subgrade, formwork or aggregates. The restraints, which lead to plastic settlement cracking, are usually an inherent part of the construction and cannot be completely avoided. The cracking can be minimized only by increasing the cohesiveness of the concrete and reducing its bleeding. The use of air-entrainment in the mix reduces bleeding and therefore will help to reduce plastic settlement cracking. The mix proportions can also be modified so as to improve the cohesiveness or water retention characteristic of the concrete mix. This is done usually by increasing the sand and or cement content. Bleeding and subsequent is aggravated by rapid drying out of the concrete. Therefore, efficient curing immediately after placing, compacting and finishing the concrete, can reduce the risk of cracking. Alternatively, The problem of settlement cracking can be overcome by re-vibrating the concrete after the initial settlement has taken place. If the initial setting of concrete permits, after about half-an-hour to an hour of initial vibration, concrete can be re-vibrated. Often this is the only practical cure. Rarely do plastic settlement cracks pass through the entire section of concrete. They will usually stop at the steel causing the restraint. So, structural integrity is not normally lost but durability of concrete can get affected. 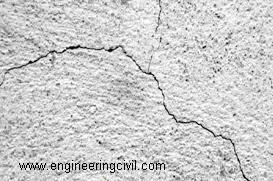 It is preferable to seal such cracks on exposed concrete surfaces to prevent subsequent corrosion of reinforcement. The most significant factor affecting plastic shrinkage cracking is a high rate of evaporation of water from the concrete. The rate of evaporation is a function of the ambient temperature, dryness of the air and the wind speed. Dryness or relative humidity is indirectly affected by temperature. The influence of wind speed should not be under-estimated since an increase in wind speed of roughly 8km/hr has an equivalent drying effect of a temperature increase of 10 Deg. C. This shows the importance of taking precautions to avoid rapid drying of concrete in summer as well as on windy days by prompt and effective initial curing. Evaporation should be arrested within the first 30 minutes to 1 hour after the concrete has been placed. Unless it is possible to wet cure or provide wind breaks (which are seldom practicable), the concrete should be covered with continuous white or transparent polyethylene sheets immediately after it has been placed and compacted. The importance of very early and efficient curing for prevention of plastic cracking cannot be over-emphasized. Although plastic shrinkage cracks usually pass right through the slab thickness, they skirt around the coarse aggregate, and aggregate interlock is maintained so long as reinforcement prevents the cracks from opening significantly due to subsequent drying shrinkage. Normally they may be neglected unless they are close to local shear force, for example around a column heads or adjoining a local bearing wall. Settlement cracks and plastic shrinkage cracks in flatwork can be eliminated by revibration of concrete when it is still in the plastic state. Revibration is also known to improve the bond between concrete and reinforcing steel and to improve the strength of concrete by relieving the plastic shrinkage stresses around the coarse aggregates particles. When the rate of evaporation exceeds 0.2 lb/ft2 per hour (1kg/m2/hr) precautionary measures are necessary to prevent the plastic shrinkage cracking. Concrete when fresh is weak as a newborn child and therefore needs all attention and protection on its exposed surface till it has gained reasonable strength. If initial protection and curing are neglected in addition to improper concrete mix, the structure will be like a weak child having inherent defects throughout its life. Plastic settlement cracks mostly occurs in certain concrete sections where the presence of reinforcement or ties, or the shape of the section itself, impedes the settlement of the mix after compaction. They can be avoided only by improved mix design, or by re-vibration of the concrete after placing. Plastic shrinkage cracks are much less predictable than settlement cracks. The only way to avoid them, especially in windy warm weather, is to cover the concrete with a polyethylene sheet almost immediately after placing, compacting and finishing the concrete. Early curing of concrete is also desirable. What is the mechanism of plastic settlement in fresh concrete? What is the difference between plastic shrinkage cracks and crazing cracks? What is the relation of pouring rate and temperature with concrete pressure on formwork?